While internet-connect Smart TV’s have had steady growth since their debut, they certainly have not become the wild-fire-spreading phenomenon that many manufactures were banking on. Instead, while sales remain firm if not underwhelming, those who do own an internet-connected Smart TV aren’t using it for anything other than watching television. According to the research firm NPD Group, outside of several video services (including cable and satellite) Smart TV owners aren’t doing much else with their internet-connected devices. 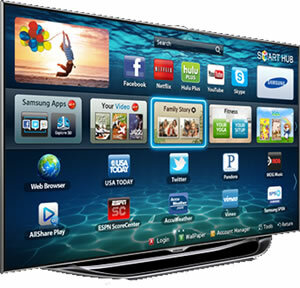 Things like checking Facebook or Twitter, or even downloading games like Angry Birds seem to be of little interest to the Smart TV crowd. Unfortunately not all Smart TV owners are utilizing the internet-connected services that can be access through their television sets. Only six out of ten consumers are using over-the-top (OTT) video streaming services through their device. The other four are simply using the TV just like a traditional set, which is most likely connected to satellite or cable. One of the only services which has seen an increase in usage from Smart TV owners is unsurprisingly Pandora, the music streaming service that has seen a robust 15 percent increase in user activity. Otherwise mobile, tablet, and gaming devices continue to dominate the living room entertainment when it comes to OTT services. Microsoft just released an additional 40 entertainment apps through its popular Xbox Live service, and having an already built-in user-base many users are simply using already owned devices to access the same content they could on a Smart TV.